I wrote these words a few months ago. The feeling of euphoria that overwhelms you after climbing back from the deep, all consuming pit that left you flattened and unable to move for fear you would shatter in to a million pieces. 2013 is about finding the euphoria more and spending less time in the dark pit. 2012 was about change and rediscovering elements of my life that had been neglected or absent in the years previous. It was about trying to figure out where I fit in my new environment and to be honest I am still trying to figure that out. 2012 was great and it challenged me and I learned new stuff and achieved goals I had set. I missed my husband and the kids missed their dad with him away on site 3-4 days each week. I missed the kids and having as much time to spend with them as I used to because I work part time. I missed my friends and so did the kids. It took time for them all to be settled in school and we still have nights where Sebastian will cry himself to sleep because he misses his best friend so much. 2012 brought a healthier lifestyle. One of my key goals when we moved to Adelaide was to eliminate as many processed foods as possible and I am proud to say that I am really happy with what I have achieved in that respect. I have always centred what we eat on fresh foods but after 12 years of country living I was excited to have more options available to me and I have embraced that. Another big goal was to run a marathon and I kicked that one out of the park in Melbourne in October in 3 hours, 33 minutes and 18 seconds. I also started working with a trainer in the gym. Initially it was because I wanted to make sure my body was strong enough to run 42.195 kms but as the year went on I really grew to love weight training. Slowly but surely I am gaining more confidence to train a few times a week on my own in addition to sessions with my trainer. I got to spend 2 weeks in New York with Steven. It was amazing. We had such a fantastic time exploring and eating our way around the city. I met some great people at BlogHer and just fell in love with the city even more than when we were there in 2011. We are trying to figure out how we can possibly visit again in 2013. Steven's dad passed away from cancer on 2nd January. I haven't been able to reconnect with old friends in the way that I had hoped. It was a lonely year in that respect but things change and people move on and I always new that forming new friendships in the city would be much harder than it is in a mining town. After being away for 12 years I certainly never expected old friends to drop everything and show up on my doorstep for a regular cuppa and chat but I guess it would have been nice to feel more welcomed and not to be the one always extending the invitations. I've spent time mourning those friendships and relationships. The change from the 15 hours a week I was working to a full three days made our year pretty hectic. Then throw in homework, swimming lessons, T-Ball, Theatre Bugs, nippers and afterschool playdates and things start to get a bit crazy. But, you know what, that's life. We survived. As the year wore on I really upped my level of organisation. Lunches would be in the fridge the night before regardless of whether it was a work day or not, meal planning happened weekly and I started making sure dinner was prepared for my work days ahead of time as often as possible. I definitely miss having as much time as I used to to just hang out with the kids. 2013 is ahead of me now. A new year. New goals and new challenges. I am looking forward to it. I can't wait to up the ante in the food area and start growing our own food. It is a family project that I am so excited about getting started on. I've set new running goals with a marathon time goal in mind. I have started my training preseason for the Gold Coast marathon in July. I am looking forward to growing my confidence even more in the gym. I am hoping to do some formal training later in the year. We just have to find the right time that works for our family. I am excited about our family holiday to NZ in April. I want to really focus on turning our house into our home, really making it our own. Hopefully I can convince Steven that we should paint one of our walls like this! As part of that I want to start sewing again. My poor sewing machine has been very badly neglected. I will continue to enjoy my job. I truly feel very blessed where my job is concerned. I look foward to sharing more. 2012 was a very disorganised year for me blogwise. My head became congested with all the things I wanted to say and I often couldn't find the words to say what I wanted. I also didn't want my blog to become a negative space and I found that I was often overwhelmed by sadness when I sat down to write. About six months ago I wanted to start writing more about health and nutrition. I have spent six months thinking and planning and note taking and I am nearly ready to push publish on my first posts on eat.move.explore . 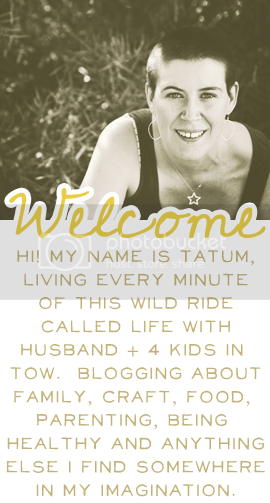 I will still blog here too but I will keep it more for personal stuff, parenting and crafting. I am excited about building it and sharing it with you. I am really going to embrace the FMS photo a day challenge this year. Our poor camera didn't see much action in 2012 and I really want to change that in 2013. I didn't do a very good job of recording our life in 2012. Thank heavens for Instagram! It's definitely my favourite place to virtually 'hang out'. I am looking forward to growing new friendships. I am excited about the new friendships that started to form towards the end of 2012. I am excited for their future. I'd love for you to join me in 2013.